When my friend first lent this series to me (the first season at least) he simply said that it was about a guy who was a hacker, and that was all he needed to say to grab my interest. Sure, hacking is a crime, but in a way there is something about crime that has a romantic appeal to us - not so much street crime committed by drug addicted individuals, but crime committed by intelligent people who are doing it to basically stick it to the man. Mind you, this isn't the only show that I've seen about hacking, they have been around since computers became small enough, and cheap enough, to begin to appear in the family home. I still remember back in the eighties when the image of a hacker was a boy sitting in front of a black and white computer in the garage surrounded by electronic parts. The classic movie of this genre would be none other than Wargames. Of course things have changed, a lot, and while Hollywood still seems to want to portray the hacker as being the young boy sitting in front of a computer, this time using fancy graphics as opposed to boring old code, the reality these days is much different, which I will discuss below. However first let us look at the trailer. Okay, as I suggested, the series is about a hacker named Elliot Anderson, however it is a lot more than that. It is about how this group called F-Society is seeking to launch this huge hack against one of the largest corporations in the world with the intention of completely wiping out everybody's debt. Further, Elliot isn't a normal person - he suffers from a number of significant mental disorders including schizophrenia. If this sounds familiar then you are correct - this first season is almost a carbon copy of the plot of Fight Club. Okay, he isn't going around starting up these secret clubs where people beat each other up, but the story which moves to a point where the entire credit industry is destroyed, thus sparking a revolution, is (though we don't see what happens in Flight Club after the buildings collapse). However there is another element to the show: Nueromancer. Okay, it has been a while since I read Nueromancer, but the setting where we have this hacker who is a member of an underground organisation that exists in the shadows, and is also caught up in the world of crime and drugs, is very reminiscent of that book. The thing with Fight Club is that it didn't involve computers (or if it did, it was only a small amount). Here Elliot Anderson by day works at a cyber-security firm, but at night he is caught up in the New York underworld where he is involved in drugs, and acting as a vigilante. My personal opinion of the show was that it was pretty good, and actually really engaging. Okay, the fact that it was a lot like Fight Club actually meant that I did become really annoyed with it at times, but I guess, like many of us, we live this dream where we could somehow join Elliot in his quest to bring down the social order. Whether we really want that or not is something that I will also discuss later. The series is very dark and gritty, and the hacking is quite authentic, which kept me coming back for more. In fact Elliot is the classic anti-hero in the vein of Tyler Durden, who can see things that many of us don't, and seeks to bring about a change that many of us do not realise that we want. As we are watching this series the one thing that we must keep in mind is that Elliot is actually a very unreliable narrator. The statement at the beginning of the series, where he raises the idea of this group of people controlling the world, who are coming after him, is a classic example of schizoid paranoia. Throughout the series there will be hints that he is watching some unnamed suit following him, when in reality this is just a random person going about his day. Yet there are scenes when this paranoia is actually realised, when he is taken by some E-Corp goons to meet one of the VPs of technology (Tyrell - who happens to be Swedish by the way). The thing about Elliot is that he actually captures the isolated nature of the computer nerd. I can relate to Elliot a lot because he is incredibly socially awkward, however with the rise of the internet and social media, this has becoming more so. I remember when I was young in the 80s, I was one of the very few people in the school that had a computer, and I was even more unique in that I knew how to program them. The thing is that many of us have always found it difficult to interact with people, namely because computers are actually very personal machines, and back in the days before computers became ubiquitous, there were very few of us who actually understood the world in which we lived. However that didn't mean that we didn't socialise. In fact while many of us weren't able to connect with our peers at school, we would find other places where we could meet with like minded people (and in Adelaide that was down at the State Library). While I never went deep into the world of the hackers back then, these groups would end up having their own social gatherings with parties and everything. The thing with Elliot is that he really is socially awkward, to the point that the only way that he can actually connect with people is through hacking their accounts. I have to say that the hacking in this show is really authentic. Mind you a lot has changed since the days of Wargames, and hacking is more than just sitting at a computer with a modem and attempting to enter another computer. Actually, with the rise of the internet, there are lots of computers that you can access, namely because they allow you to access them. However this is only the surface of the computer. Sure, you can get into a bank's computer, and even have access to your account and do all of your banking from home, however the bank will only allow you access to certain parts of the computer. This is where the idea of social engineering comes into play. Sure, it is suggested that there are only a small number of passwords that people use, and when they do have a password they tend to use the same password for every site. This is whe the problem lies because if the hacker learns of this password they have access to your entire digital life (which is why I suggest that you have a different password for every site you visit, and also make passwords for sites such as Facebook really hard to guess - if a hacker gets into your Facebook account then they may actually have access to a lot more than just Facebook). Sure, some institutions, such as banks, force you to have sophisticated passwords, but in the end people are still pretty lazy. However in Mr Robot we see the reality behind hacking. For instance one of the characters (Ollie) is given a CD on the street, and when he puts it into his computer it downloads a program which gives the hacker access to his computer, and in turn to his entire online financial and social life. With that information he is then able to blackmail him. We even see Elliot borrow a target's phone simply get grab some information that would help him hack his account. We should also note that Elliot has managed to get himself a job (through a childhood friend) at a computer security firm that happens to have a contract with E-Corp, one of the largest corporations in the world. This connection is no coincidence as it gives Elliot an inside channel to fulfil his goals of causing mass disruption and also bringing about a social revolution. If it wasn't for Elliot's connections with Allsafe, it is highly unlikely he would have been able to undermine the corporation's security and launch the hacks. The other interesting thing that I noted, literally from the beginning, is how F-Society is clearly based upon the famous hacking collective Anonymous. The main antagonist in Mr Robot is this massive corporate behemoth known as E-Corp (which Elliot refers to as evil corp). 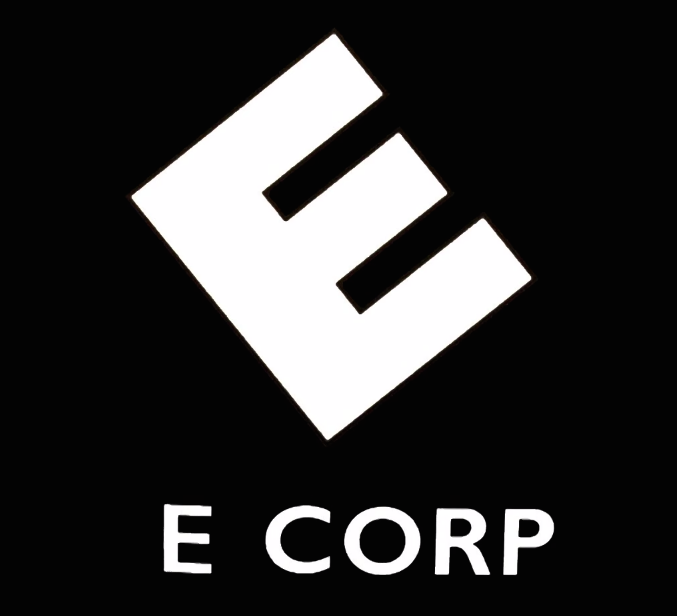 The thing that I instantly noticed is how similar the E-Corp logo is to another hated corporation: Enron (and I suspect that the similarities are intentional). What we know about E-corp is that they have their fingers in literally every pie, to the point that if you get sacked from E-corp you literally have nowhere else to go. In the world of Mr Robot we know that E-corp produces technology (as all of the computers at Allsafe bear the E-corp brand), but they are involved in real-estate and banking. There-in lies the problem - the corporation is so powerful that when the hack succeeds it literally brings about the economic collapse of the entire society - there is no built in redundancy in the world of Mr Robot. This is the strength of the modern corporate model - redundancy. If one bank were to collapse, then there are three other banks that are able to maintain the status quo. Further more most, if not all, corporations tend to be very limited in their operations. For instance you will not find a bank selling agricultural technology, in the same way that you will not find a technology firm issuing credit cards. The reason for this is that it is much easier of a corporation to specialise in one area, and thus profit from that one area, than to attempt to be proficient in many areas. Okay, there is one company that does have a broadbase of operations and that is Warren Buffett's Berkshire Hathaway, but even then that is primarily an investment house (simply because Warren Buffett just loves investing, and purchasing, well run and profitable businesses). Okay, we do see some companies expanding their operations - for instance Woolworths, a supermarket chain in Australia, offers credit cards and insurance, however if you look under the branding you will discover that they actually offer the products of a third party under their own brand. This is an important thing to consider - the brand. Virgin could also be considered a conglomerate, but what it is in reality is that it is a brand, you don't take out a Virgin Credit card, fly a Virgin airplane, or workout at a Virgin gym - you buy into the Virgin brand. Another interesting thing that I have noticed as well - credit card systems. Once again the banks may offer the credit cards, and may also run a line of credit for you, but if you actually look at your card you will discovered that it is actually by one of three providers - Mastercard, Visa, or American Express. While these companies may not actually provide the line of credit - the bank does - these companies provide the means to transfer the money across bank accounts (while skimming a little off the top for their own pockets). Like Fight Club, Mr Robot seems to take the consumer society squarely in its sights, but not just an economic system that is based entirely upon the endless desire to buy more stuff, but to get people into debt so that they can have that stuff. Okay, while in Australia we are fortunate that our universities are relatively inexpensive (and we don't have to pay back our student loans immediately - the loans are held by the government and we only have to start paying them back once we hit a certain threshold) and we have a system of universal healthcare, this isn't necessarily the case in the United States. From people that I have spoken to their first, and major, debt is always their student debt, and the payments begin as soon as they finish university. From what I have also learnt, this is also a debt that can't be got out of in the way that other debts can (such as selling the house - you simply cannot give back your degree). Further, with a fully privatised medical system, the worse thing that can happen to somebody in the United States is to get sick. This differs from consumer debt, which is debt that we voluntarily take on to have more stuff sooner. With private universities prevalent, and the low pay that entry level jobs offer, many Americans, if they even manage to finish university, find themselves enslaved to debt pretty much all their lives. Mind you, it isn't as if consumer debt is something to be laughed at, or to lay the blame on the people who blindly take it out - the modern marketing mechanism is designed to lure as many people into its grips as possible. Marketing isn't about selling stuff, marketing is about creating a story that people want to be apart of - they are selling the good life, a sense of identity. Take the Mastercard add for example - there are things in life that are priceless, everything else there is Mastercard. The adds are actually very deceiving as they suggest that to get to those priceless moments you need to purchase things through your Mastercard. In a society where wages are stagnating, and prices are going up, people are more and more resorting to debt to live that life, and it is not that they are doing it necessarily through their own will, they are doing it because the marketing mechanism keeps on telling them that if they have this, do that, go there, then their life is going to have meaning, and it doesn't matter if you don't have the money now, because that Mastercard in your pocket will cover it. Thus, like a fly to a honey pot, consumers are led further and further into the debt trap through the seductiveness of advertising. Okay, there are probably a few spoilers that I could mention, but the one that seems to be plaguing me the most is: what happened to Tyrell. Hopefully, if you have decided to jump the Spoiler Alert pic then you will have already watched the series, but if you haven't then I do recommend that you stop right here and get your hands on the series. Anyway, as you are probably aware, in the final episode Elliot awakes up in Tyrell's car after the person looking after the carpark knocks on the window and asks him for cash. At first I thought that Elliot may have had an affair with Tyrell, but then it becomes apparent that Tyrell isn't actually in the car. Anyway before I continue here is a Reddit post that postulates that Tyrell and Elliot are in fact the same person. I at first thought that maybe Elliot killed Tyrell and dumped the body, but a part of me feels that this is too simple a solution that doesn't really do justice to the series. Further, we know that Elliot isn't a murder, however we also know that his alter-ego - Mr Robot - is more than willing to sink to such a level. Anyway, before I continue, here is an interesting rundown of the final episode of season one. So, there are a couple of things I wish to float, and the first one is the hack. I'm not entirely sure that the hack is going to be as groundbreaking as we expected it to be. Sure, the world economy is collapsing, and people are out in the streets in F-Society masks. However, remember the after credits scene - White Rose and the E-Corp CEO are cosy, and we also know that the E-Corp CEO doesn't seem to be all that concerned with what is going down. I suspect that it is more than possible that this hack was a ruse to give E-corp even more power (particularly since there is the distinct possibility that the Chinese server wasn't actually taken down). As for Tyrell, let us consider this couple of things. Is he Elliot? I'm not really sure. As I pointed out there is a convincing argument that he is, however while I have recently watched the show, the problem would be if Gideon saw Tyrell independently of Elliot. If that was the case, and Gideon knows both Tyrell and Elliot, then the two characters are different. However, I also note that the only person who encounters Elliot at Steel Mountain is Tyrell, and he doesn't question him as to why Elliot was spending so much time in the toilets. We also know that one of the main reasons that the hack succeeded is because Tyrell, in a parting shot to E-corp, turned off the honeypot and left orders that it is not turned on again, no matter who says otherwise. However, the problem is that Tyrell was recently sacked, which means that any orders that he placed before he was dismissed would have been null and void, which means that Gideon could easily has reinstated the honey pot. This, I suspect, further points to the idea that this whole catastrophe was being arranged by the CEO, who no doubt is using the economic chaos that it has created to further entrench E-corp's power. However, in the end, I think we are simply going to have to patiently wait for season II to come around. Here is a blog post on Mr Robot's connection to the 1983 classic Wargames. While it may be a bit technical, this post looks at the various hacking tools used in Mr Robot. This is another post on the authenticity of hacking in Mr Robot, and is a little less technical. Here is a review of the final episode of Mr Robot. Mr Robot - The World of the Hacker by David Alfred Sarkies is licensed under a Creative Commons Attribution-NonCommercial-ShareAlike 4.0 International License. This license only applies to the text and any image that is within the public domain. Any images or videos that are the subject of copyright are not covered by this license. Use of these images are for illustrative purposes only are are not intended to assert ownership. If you wish to use this work commercially please feel free to contact me.